Photographers Robert Holmes and Andrea Johnson along with writer Jordan Mackay have accomplished the masterful task of creating a book that captures the spirit of Pinot Noir. To satiate my own passion for Pinot Noir, I had envisioned doing a similar project for several years but never found the time. Imagine how thrilled I was, then, to discover this beautiful book with breath taking photography of American Pinot Noir winegrowing regions and wine people. The hardcover book is more than a fancy picture book to put out on your coffee table and forget about. It is filled with pinotspeak and valuable information about the one grape that is uniquely capable of creating an almost religious passion among its devotees. Following a foreword by noted wine writer, Eric Asimov, the contents weave a journey through the vineyards and wineries of America, stopping along the way to capture the essence of Pinot Noir. Chapters include: A Perfect Storm of Pinot, Terroir, A Year in the Vineyard, From Grape to Wine, and In the Glass. For a peak of the book and some of its pages, visit www.pinotbook.com. The book is currently available at multiple wineries in California and Oregon listed on the pinotbook website and the authors are traveling to wineries for book signing events. 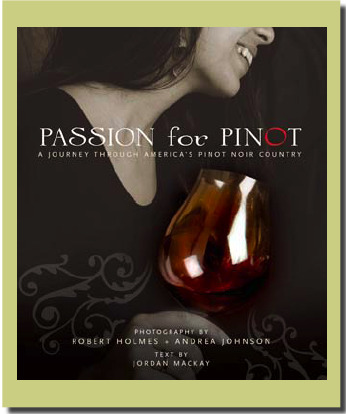 Passion for Pinot will be available nationwide at bookstores in March of 2009 and is available now for pre-order at the published price of $30.